Are you looking for a skin product that can make your skin flawless and radiance shinny? Provides your skin with really soft touch, exfoliates and reduces UV damages, keeps your skin hydrated with anti-inflammatory factor? Oh, you think it is impossible to find all these benefits in one product? No? Usually, you will not find it though how hard you search for such a product that takes care of your skin in all these regards but we have made it possible by introducing Levea Anti-aging Radiance Hydra Cleanser. Our cleanser is specifically designed for you if you are someone who is aiming at the perfect skin. Well, at Levea skin care, we aim at developing products that not just provides anti-aging benefit but something amazing enough to nourish your skin in multiple ways. Nowadays, there are many girls who are yet in their 20s and 30s but still facing problems of the rough and wrinkled skin. Le’vea is for all the ladies aspiring for skin care. Do not forget to include Levea Anti-aging Radiance Glow Hydra Cleanser in your skincare routine if you are looking for soft, smooth and flawless skin. You do not need to worry about the forehead wrinkles or fine lines around your eyes because you have not drunk the elixir of immortality. So as we humans age, we face aging-related problems. Remember that all problems are meant to be solved. Hence the signs of aging usually start to appear on your skin, mainly your face. Feeling worried? No, you don’t have to get anxious about it because your age is demanding a proper skincare. For impeccably smooth skin and wrinkle therapy, here at Leveaskincare.com, you are offered to pick our Le’vea Anti-aging Radiance Hydra Cleanser for your skin to get uplifted and nourished. All essential ingredients like Vitamin B5, lactic acid, green tea extracts, and white tea extracts are critical for anti-aging formula. Vitamin B5 (Panthenol) is helpful in the formation of new cells in addition to providing hydration to your skin. Lactic Acid is another critical a kind of acid that not only exfoliates skin but also thickens the epidermal of your skin. Hence, through Lactic acid, exfoliation is thoroughly done and consequently, the dullness vanishes away from your skin. Moreover, the presence of Green tea extracts and white tea extracts, which are strong antioxidants, in our product are helpful in repairing your wrinkled skin apart from hydrating your skin’s roughness and dryness. Camellia Sinensis (Green Tea Extract, White Tea Extract) is a product ingredient with anti-inflammatory benefits. In short, Levea Anti-aging Radiance Glow Hydra Cleanser is composed of all these necessary ingredients that are required for your skin, especially for the anti-aging regime. So what are you waiting for? Le'vea Anti-aging Radiance Hydra Cleanser will make you look like a girl of 25 years! Are you wishing to become a dream girl with fantasied skin glow? Hurry up and start your anti-aging beauty regime by simply reaching out our Le'vea Anti-aging Radiance Glow Hydra Cleanser. 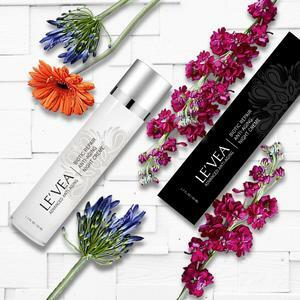 Log on to Levea.com and start with advanced anti-aging skincare right away.